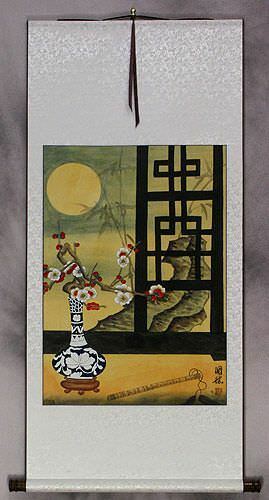 Artwork Panel: 53.6cm x 98.1cm ≈ 21" x 38½"
Silk/Brocade: 62.8cm x 153.4cm ≈ 24¾" x 60¼"
Width at Wooden Knobs: 71.8cm ≈ 28¼"
This scroll has the classic style and theme of traditional China. The title means, "Education brings prosperity." 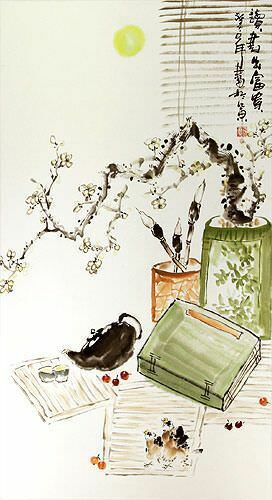 The artwork features a plum blossom along with all the articles needed to write calligraphy (blank books, calligraphy brushes, an inkwell, and of course a teapot).